Today thriller and mystery author Lori L. Robinett sits down for an interview. Learn more about Lori and her books at her website. When did you realize you wanted to write novels? When I was about 10 years old, I began to fill spiral notebooks with my stories. Even back then I knew that’s what I wanted to do! How long did it take you to realize your dream of publication? <Cough> a long, long time. I drafted my first novel in 2004, during National Novel Writing Month. That book was published in 2014. Yup. Ten years. A decade. Are you traditionally published, indie published, or a hybrid author? Hybrid, technically. My first book was published by a small press, and they offered a contract on the next book in the series, but I declined. I like the control that indie publishing offers me – I can subcontract out my cover and editing to end up with a product I can be proud of. At home, generally. Sometimes in my home office, but often sitting on the couch with my laptop in my lap. Is silence golden, or do you need music to write by? What kind? It depends. For my first mystery I listened to a lot of Nickelback and gravelly-voiced singers. While writing my last novel, Fatal Obsession, I listened almost exclusively to a channel called “Angry Breakup.” It worked quite well! How much of your plots and characters are drawn from real life? From your life in particular? The plots don’t come from my life . . . but do come from things I see. For instance, I read a news release about cancer research being done at the Nanotechnology Center at the University of Missouri a couple of years ago. That intrigued me and niggled at my brain for several months before the idea for Fatal Obsession germinated as I began to wonder what would happen if nanites were injected before the patient had cancer. Describe your process for naming your character? I look through baby name books, use online character name generators . . . and then the name usually comes to me at 2 a.m.
Real settings or fictional towns? I use fictional towns in real locations. Fatal Obsession is set in eastern Tennessee, and I created a fictional town called Enterprise in the real Technology Corridor near Oak Ridge. That said, my main character goes to Gatlinburg and Pigeon Forge, and visits real places. What’s the quirkiest quirk one of your characters has? Hmmm. I’ll have to think about that. There’s not much quirk in my current book . . . but another of my manuscripts (in the to-be-edited pile) has a character who is a former pro wrestler, and he routinely goes jogging in electric blue spandex. It makes me smile just to think of him! Not sure if this qualifies as a quirk -- or if it just makes me a nerd -- but I’m a Trekkie. That means I spend my vacations going to Star Trek conventions, can spot Trek actors a mile away, and one of my most prized possessions is a print signed by George Takei, Walter Koenig and William Shatner (all autographs which I got in person). If you could have written any book (one that someone else has already written,) which one would it be? Why? Black Beauty because I loved the way that book took the voice of an animal character and gave it realism and depth and emotion. Everyone at some point wishes for a do-over. What’s yours? Oh, wow. There’s a lot I’d like to do over. My biggest would be to go back and have another go at being a mom to my girls when they were younger. I’d stress less about what others thought of me, and spend more time playing with them. Greed. I can’t stand people who are greedy. I mean, come on, there’s plenty of stuff to go around. Share. You’re stranded on a deserted island. What are your three must-haves? A replicator (Trekkies will get that one), an e-reader loaded to the max with all sorts of books from every genre, and a lifetime supply of sunscreen (I have two colors: white and red). What was the worst job you’ve ever held? I was a telemarketer selling children’s books. I spent hours dialing numbers, reading a script, and getting rejected. It sucked. That’s tough, but I have to say, it might well be a little ebook called Getting Dumped by Tawna Fenske. It’s like a Choose-Your-Own-Adventure for grown-ups. It’s funny and creative and you can read it over and over. Do I have to choose? I want to lounge on a beach with mountains reaching up to the sky behind me. City girl/guy or country girl/guy? I’m a city girl who dreamed of living a country life . . . who found my country guy, who made my dreams of living out in the country come true. I’m working on the next book, which is about a young woman inducted into a secret society of powerful women. Anything else you’d like to tell us about yourself and/or your books? I put Easter eggs in all my books. They’re goofy little things that only certain people will get. For instance, in one of my books, there is a character named Mr. Ian Woon. That’s an anagram for NaNoWriMo (National Novel Writing Month). In another book, a main character’s last name is Frakes, the last name of the actor that played Will Riker in Star Trek: The Next Generation. I'm a scrapbooker. One of my books, Diamond in the Rough, even has a special edition, which contains a section of projects shared by Gina, the main character, who owns a scrapbook store. Also - if folks sign up for my mailing list (they can find the form on my website), they’ll get a free copy of Train of Thought - which includes a sneak peek at my next book. A technothriller ripped from real research. A mother’s love for her unborn child, a man’s love for his dying mother - both caught up in a race for survival. 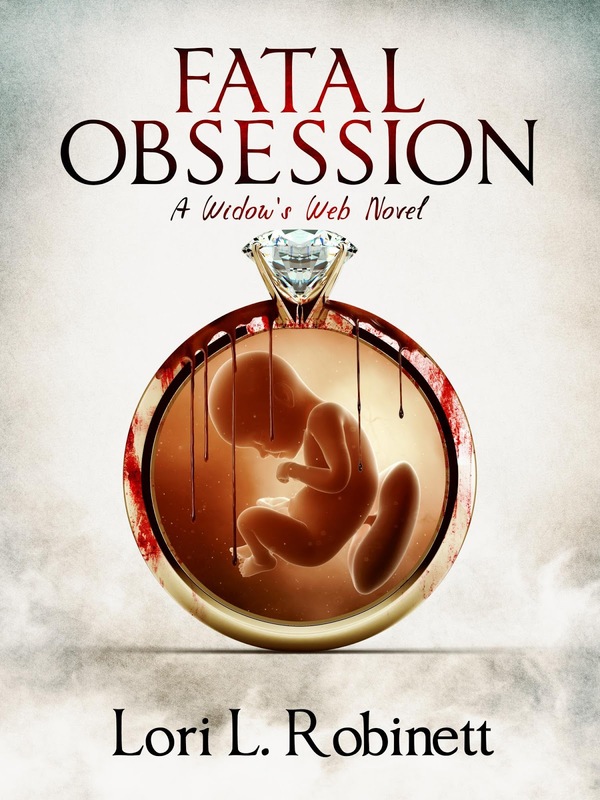 Baby Eve is the subject of a secret experiment, resulting in the potential cure for cancer coursing through her veins as she grows within Sophie’s stomach. A rich, powerful man is determined to harvest that research to save his mother before she is eaten alive by cancer. Sophie goes on the run to save her baby from the only man who knows what is growing within her. An innocent babe and a sick old woman fight for their lives, but only one can survive. Suzanne Stengl has been telling stories since she was a child. Then, it was stories about fairies and mermaids, told to her sisters when they were supposed to be sleeping. As a teenager, she wrote long diary entries and short pieces of fiction that no one ever read. Learn more about Suzanne and her books at her website. Today Suzanne is being interviewed down in the Galapagos. Hello everyone. I’m American Woman travel editor Serena Brower and I’m here with Suzanne Stengl, the author of light paranormal cozy mystery novella The Ghost and Christie McFee. 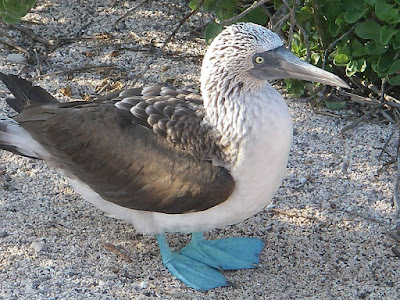 I found Suzanne in the little village of Puerto Baquerizo Moreno on the island of San Cristóbal in the Galapagos Islands. 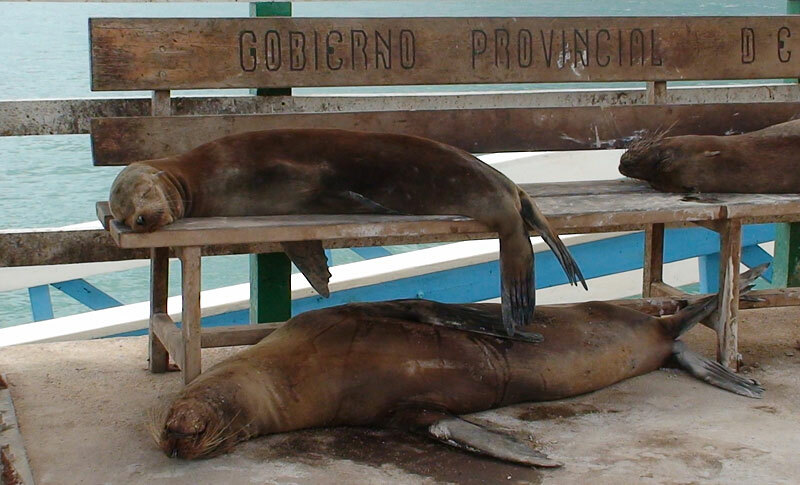 Or as they say here, Las Islas Galápagos. We’re enjoying some ice tea in an open air restaurant beside the ocean and watching the sea lions lazing on the beach. SB: I’m glad to finally meet you, Suzanne. Do you have time for a few questions about your book, The Ghost and Christie McFee? Suzanne: (pouring a pitcher of water over her head…) I have all the time in the world. SB: It’s really hot here, isn’t it? Suzanne: It sure is. Forty-five degrees Celsius. In the shade. SB: Whoa. (fanning herself) What’s that in Fahrenheit? Suzanne: You don’t want to know. SB: I understand you have some pretty authentic details about scuba diving in your book? Suzanne: Yes, authentic. I’ve experienced every one of them. SB: I’m beginning to understand how hot it would be wearing a 7 mil neoprene wet suit in this heat. Do you really need a wet suit? The water doesn’t look that cold. Suzanne: The water temperature here ranges from 64 to 86 degrees Fahrenheit at the surface, depending on the season. Of course it gets colder as you go deeper. So you need a wet suit. SB: If it’s as low as 64 degrees Fahrenheit, that’s similar to the temperature of Lost Lake, isn’t that right? Suzanne: Yes, it’s similar. And in both places, in a wet suit, the temperature is perfect – once you’re underwater. It’s beautiful. (She looks out at the ocean.) There’s a wreck right here, in the harbor. Suzanne: A sunken ship. It makes an artificial reef. A place for algae to grow and invertebrates like barnacles and corals and oysters. They provide food for the smaller fish, and then the smaller fish in turn provide food for the larger fish. SB: (fanning herself) I don’t know how the tourists can stand wearing a wet suit until they get in the water. SB: Do the staff care about you doing that? Suzanne: No, they’re used to me. SB: OK, let’s talk about your book. The opening scene in The Ghost and Christie McFee has your heroine on a dive boat. And she’s seasick. Have you personally experienced that? Suzanne: I sure have. We did an 8-day tour aboard the Yolita here, in the inner islands, with a group of 16 passengers and 5 crew. Every one of the passengers got sick on the first day. Including Rolf. SB: Rolf is your husband? Suzanne: Yes, he is. He’s a traveler. SB: You’re quite the traveler too, I must say. Suzanne: No, I’m not. I’m a tourist. There’s a difference. SB: Then, you’re quite the tourist. Suzanne: I’m the tourist from hell. (She dumps more water over her head.) I should have known I’d get seasick, since I also get carsick, and bus sick, and avoid roller coasters. And like I said, everyone got sick for a day. But since I’m so good at being seasick, I did it for the full eight days. SB: That must have been horrible! Suzanne: Parts of it. Parts of it were great. The food was excellent. Although it would have been even better if I hadn’t been so nauseous. And the passengers aboard the Yolita were incredible. Mostly young travelers, all interesting people. The sixteen of us would sit around the big table for meals. For the first few days, French was the default language and then we changed out a few passengers and the default language became English. We had Italian, Swiss, British, Swedes, one guy from California, and the French. Every day we walked different trails on different islands and saw the endemic plants and animals. 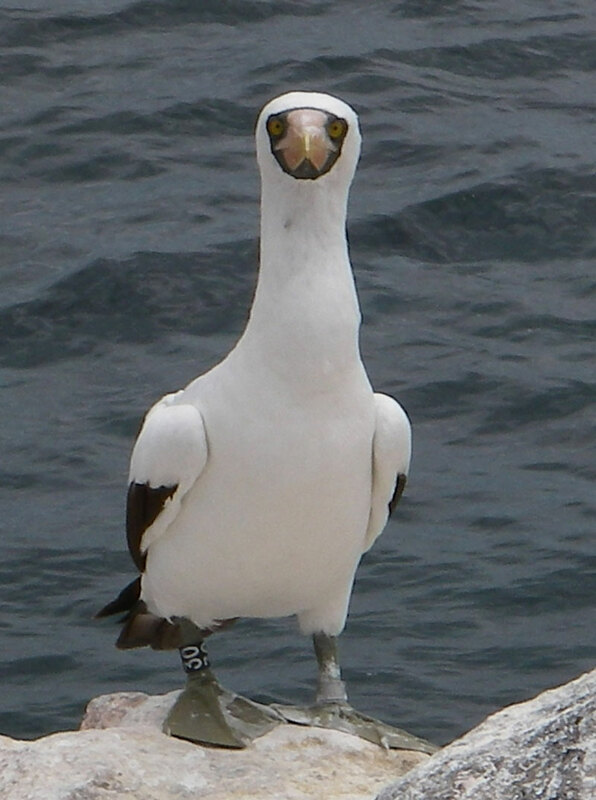 It was a mixed blessing, being on shore. No seasickness, but the heat was extreme. For me, anyway. Before I left the boat, I’d soak my shirt so I could be cool for a time. At the end of the hike, I’d walk into the ocean. I love my Tilley hat . . . because I can dip it in the water and douse my head, when it isn’t possible to jump in completely. SB: When would it not be possible to jump in completely? Suzanne: If it was a beach that the sea lions had claimed. They can be territorial. Suzanne: I don’t know why they love those benches, but they do. SB: Okaaay . . . So, you slept aboard the boat? Weren’t you seasick while you were trying to sleep? Suzanne: Yes. Some nights, when we were making a long open water crossing between islands, it was especially rough. Many of us would lie on the sundeck and watch the stars. SB: And that helped the seasickness? Suzanne: Yes. The stars don’t move so they are a reference point. It’s like focusing on the horizon in the daylight. And it was fun, lying there with everyone. Kind of like a pajama party. SB: Hmmm. But with being so seasick, weren’t you afraid you’d be sick while you were diving? That couldn’t be good. Suzanne: It’s a real leap of faith, for someone like me – a non-adventurous tourist – to sit in a zodiac fully loaded with dive tank, 7 mil neoprene and 13 pounds of weights. And feeling nauseous. If you throw up underwater, it’s important to keep the regulator in your mouth. Suzanne: Otherwise, you’ll drown. But I learned to deep breathe until we tipped over the side. And then all of a sudden, I was underwater and no longer rocking and I was out of the heat. My head was instantly clear and, for about 30 to 40 minutes, life was normal. At least, it was normal for my head and my stomach. The rest of the world was not normal. Suzanne: No, it was amazing. Sea turtles, sea lions, penguins, sharks, rainbows of fish. And when we weren’t diving, we were snorkeling. Snorkeling with the little penguins is something I will remember forever. SB: Too bad you can’t forget about this heat. Can you pass me that water jug? SB: (dumping water over her head) I’m glad it’s not this hot in Bandit Creek. SB: Does your heroine Christie McFee get over her nausea and learn to love diving? Suzanne: You’ve just read the first chapter so far, right? Suzanne: Then you’ll find out in chapter two. More ice tea? Even though Lost Lake is renowned for claiming the lives of divers searching for the legendary gold buried in its depths, Christie McFee is determined to explore the Lake’s underwater ghost town. And when a ghost from the past convinces her to join the treasure hunt, she throws her usual caution overboard. 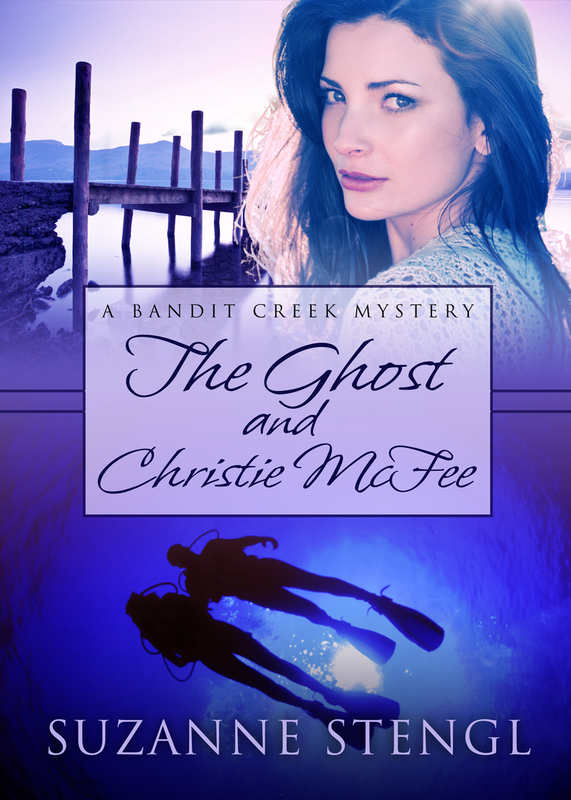 Sure that the talk of ghosts is strictly for tourists, Gaven St. Michel, local Divemaster, is confident he can keep Christie’s lovely body from being added to the Lake’s count—until another ghost appears amid the watery graves in Bandit Creek. Will Gaven be able to protect Christie as she drifts deeper into the murkiness of this unsolved mystery from long ago? Last week we talked about natural beauty treatmentsusing coffee grounds. Today we’ve got some household uses for those same used grounds. 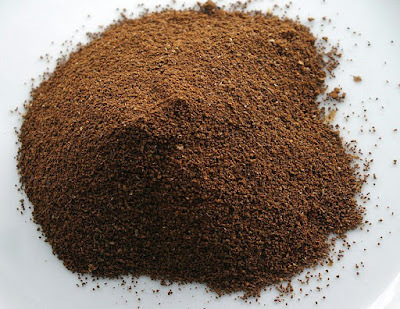 Many people recycle their used coffee grounds by dumping them onto their composting pile. Coffee grounds make excellent “green” matter because they’re rich in nitrogen. In addition, the coffee attracts beneficial worms. However, there are quite a few other uses for those coffee grounds once you’ve gotten your daily (or in my case, hourly) caffeine fix. You can make fertilizer with used coffee grounds. The coffee adds nitrogen and potassium to the soil and boosts magnesium to help keep plants healthy. Simply mix the grounds with grass clippings or brown leaves and spread the mixture around your plants. You’ll need to add lime or wood ash to the mix to encourage blooms and fruit, though, because without it your fertilizer will lack calcium and phosphorous. If you just need to lower the pH levels in your soil for hydrangeas, azaleas, and rhododendron bushes, sprinkle used grounds around the base of the plants. If you don’t like using salt to keep from slipping on your icy steps, sidewalk, or driveway and have found kitty litter creates too much of a mess, try substituting used coffee grounds. Got furniture scratches and nicks? Dip a Q-Tip into wet grounds and dab to hide the marks. Before you clean the ashes out of your fireplace, cover them with damp grounds. This will minimize the ash dust created when you sweep out the hearth. Used coffee grounds will absorb odors in your refrigerator and freezer in much the same way as baking soda. Place a small open container of used grounds in the back of your fridge. Swap out with newer used grounds once a month. Coffee grounds are a natural abrasive. Replace harsh chemicals with used coffee grounds to scour away stuck-on food from dishes, pots, and counters. Want an antique look for cloth, paper, needlework or other arts and craft projects? Wet coffee grounds are an excellent natural dye. Add water to the grounds and soak the material until the desired shade is achieved. As you might imagine, I have an extensive collection of cookbooks. (Okay, I’ll admit it: I’m a cookbookaholic.) Today I thought I’d share with you my latest purchase, The Sprinkles Baking Book: 100 Secret Recipes from Candace's Kitchen by Candace Nelson. However, I've found this baking book too special to shelve with the rest of my collection. It’s not only filled with wonderful recipes for all sorts of delectable cupcakes, muffins, cakes, pies, cookies, and other desserts, it’s part art book due to the wonderful photographic images. In my home it now resides in a place of honor on my coffee table, easily within reach for perusing whenever the urge strikes. 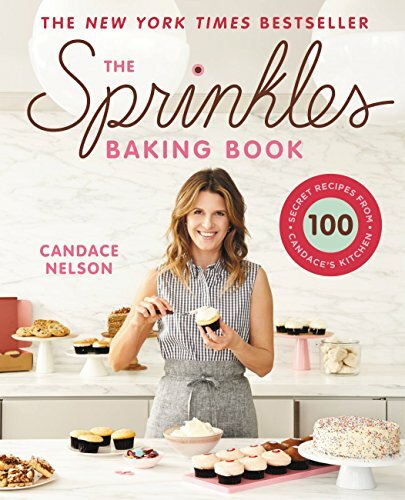 In The Sprinkles Baking Book: 100 Secret Recipes from Candace's Kitchen, which is also Candace’s first cookbook, you’ll not only find 100 of her favorite recipes, including 50 Sprinkles cupcake recipes, she’s even created a few new cupcakes especially for this book. My favorite is the crème brûlée. And if all that weren’t enough, there are even some guest recipes from various Sprinkles fans such as Barbara Streisand, Reese Witherspoon, and Julia Roberts. Spring is finally here! Are your crocuses and daffodils blooming yet? Have you picked up your pansies at the gardening center and freshened up your flower beds? If you live in a part of the country where winter still has it’s cold grip on you, why not curl up on the couch and celebrate spring vicariously with some cross stitched pansies? This 3” x 3” design (when stitched on 14-count fabric) will help you forget all that snow and bitter temps. And just maybe, by the time you finish stitching it, spring will have arrived in your neck of the woods. Cj petterson is the pen name of Marilyn A. Johnston whose publication credits include two contemporary romantic suspense novels as well as nonfiction and fiction short stories that have appeared in several anthologies. She is currently working on a mystery series. Today cj sits down with us for an interview. Learn more about her at the Lyrical Pens blog. After I retired from Chrysler in 2001. My job required a lot of travel and long hours, and when I retired, I had the time to do something else. I took a class at the University of South Alabama in 2003 called “Storming the Walls of the Publishing Industry,” got positive feedback on the first seven pages I wrote, and was hooked on learning as much as I could to scale those walls. Those seven pages became the start of my second novel that was published in 2015. My first three short-story memoirs were published in 2008: “Don’t Ride the Clutch” in Cup of Comfort for Divorced Women, “The Blue-Eyed Doll” in Christmas is a Season 2008, and “Dancing with Daddy” in Christmas Through a Child’s Eyes. I am traditionally published so far, but looking into indie publishing for the novella I’m working on. My Dell computer is in a bedroom I converted to an office that I share with my photographer son and his Apple computer and a slew of other equipment and furniture. I like to listen to music without lyrics. My son likes the white noise of a fan so I have both going on when I write. About fifty-fifty. There is a part of me, real or wished-for, and/or my personal adventures in all of my female protagonists. That’s especially true in one of my romantic suspense novels. I once spent five-and-a-half days whitewater rafting in Colorado and a year later spent two days driving a doors-off, stick-shift Wrangler on a Jeep Jamboree off-road adventure in the Sierra Nevada Mountains. The protagonist in my romantic suspense novel Choosing Carter enjoys some of these same adventures. That’s a challenge always. I read newspapers, magazine, obits, and do Google searches, but I would never use a complete name from anything I’ve read. I want character names to reflect their nationality or where they live. Because I correlate words and names as musical, my character names have a rhythm. The names are, hopefully, a bit unique even if they do, I am sure, really belong to somebody somewhere…Mirabel Campbell. Bryn McKay. Carter Danielson. Anders Olsson. I have to say both, but even the fictional ones are based on real places I’ve been to or lived in. My short story, “Bad Day at Round Rock,” is a historical fiction piece based on real events that took place in 1878 in the real cow town of Round Rock, Texas. I think of quirky old Talley Munroe, the unwashed prospector in “Bad Day at Round Rock,” who dreams of finding a hidden cache of stolen gold then loses both his life and the gold when he finds it. I used to do all my ironing wearing high heels, but I do very little ironing now and I’m wearing aerobic trainers. However, I still love to hang my laundry out to dry on the clothes lines outside my laundry room. I would love to have written Charlotte Brontë’s Jane Eyre, because I think it’s the ultimate romance novel. I wish I had started college in my teens or twenties instead of waiting until I was thirty-seven and divorced. People who assume they know what I’m going to say or do in a given situation…and then I do it! Ticks me off to be so predictable. Survival things . . . a way to make potable water, a way to fish, and my Bible. I worked in the labor relations department of a large corporation early in my career. My boss was almost intolerable. I started every morning with a prayer that I could get through the day without quitting or getting fired. As sole provider for my mother and my son, I couldn’t afford to do either. I felt like I was in jail. There are too many to choose from, so I’ll pick the one that hooked me on action, adventure, and historical stories: Last of the Mohicans by James Fenimore Cooper. I was about ten years old when I read that one. It took me several weeks one winter, but once a week, I tramped through snow (seriously) to the Mark Twain Library in Detroit to read it. Sounds a lot like the old saw of walking five miles to school, barefoot through the snow, uphill both ways, but hey, the story absolutely fascinated me. Gosh, I hope there are more novels, either the second book in a possible detective series or a stand-alone. But I’m not a fast writer. I’ve never been able to throw words at a piece of paper and then go back later for edits. Like computer coding, the next scene doesn’t work for me until the one before it is as good as I can make it . . . at the time. Of course, it gets changed later. Writing that “decent first draft” means it takes me a long time to complete a novel. I know. I know. Hiring a development editor could speed up the process. I am especially happy with “Bad Day at Round Rock,” and was thrilled when the publisher accepted it with a one-word edit. Everything in the story about Sam Bass is as true as newspaper reports and lore have made it. The character Lilly Malmstrom is a composite of my imagination and my black-haired, blue-eyed, maternal grandmother, Selma, who emigrated alone from Sweden in 1904 at the age of 18 and truly did have to work off a debt because her money was stolen on the ship. 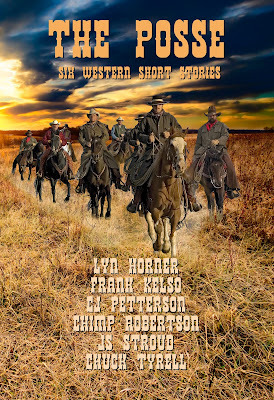 Seven authors contributed short stories to The Posse. The are Lyn Horner, “The Schoolmarm's Hero”; Frank Kelso, “One Way or Another” and “Tibby's Hideout”; Charlene Raddon, “The Reckoning”; Chimp Robertson, “Headed for Texas”; Jim Stroud, “Savage Posse”; Chuck Tyrell, “Set a Thief”; and of course my own “Bad Day at Round Rock”. When the outlaw Sam Bass robbed the Union Pacific train of $60,000 in uncirculated gold pieces, he set off a chain of events that culminated in a “Bad Day at Round Rock.” Men lose their lives seeking their fortunes, outlaws are shot down in the streets, an innocent man is accused of murder, and a girl becomes a woman in a story of history, mystery, myth, greed and love torn from the pages of West Texas history. If you’re looking for natural beauty products, look no further than your used coffee grounds. Coffee grounds are a great exfoliating body scrub. Simply mix with some warm water and your favorite all-natural oil, then scrub from head to toe. To make a natural alpha-hydroxy, antioxidant facial mask, combine two tablespoons of used coffee grounds, two tablespoons organic cocoa powder, three tablespoons whole milk or heavy cream, and a heaping tablespoon of honey. Mix together and apply to your face. Sit back and relax while the natural elements work their magic on your skin. Coffee grounds will also remove built-up residue from hair care products. Before shampooing, massage a handful of used grounds into your hair. The coarse texture of the grounds will release the product residue without damaging your tresses. Want to get rid of that cellulite? Try coffee grounds. Scrub coffee grounds mixed with warm water over cellulite affected areas of your skin for ten minutes twice a week. You should start to see results in about a month. Helen Bennett is a freelance writer previously employed in the healthcare sector for many years, with a varied career that took in many aspects of helping people, particularly in matters relating to diet, nutrition and fitness. She joins us today to discuss the benefits of keeping a journal. 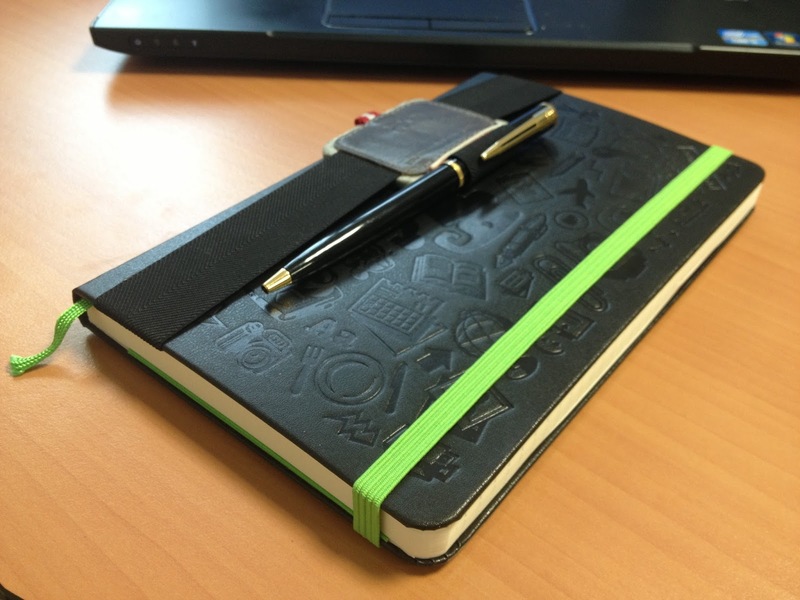 Could Writing a Journal Be Good for Your Health? If you have aspirations to succeed as a writer, than journaling everyday could change your life. Many successful writers choose to keep a journal: the importance of keeping a journal is something that Virginia Woolf wrote extensively about, sharing in her letters: 'My belief is that my habit of writing this for my own eye only is good practice. It loosens the ligaments...I believe that during the past year I can trace some increase of ease in my professional writing to my casual half hour after tea.' Other famous literary journal writers include Ray Bradbury, Susan Sontag and CS Lewis. The more you write, the more your writing skills will increase, and for writers of memoir journals, provide important lessons in chronology and forming a solid narrative arc. However journal writing is not just for writers because it does so much more than simply improve the quality of your writing: it can also improve mental and physical health and wellbeing. It might seem illogical, but there is mounting evidence to suggest that jotting down just a few sentences in your journal each day can actually help to boost your immune system. University of Texas at Austin Psychologist and Researcher James Pennebaker has conducted extensive investigations into the power of journal keeping, and found that regular journaling strengthens the T-lymphocyte immune cells. By strengthening your immunity you will increase your overall health, reducing your likelihood of suffering from colds, the flu, and other contagious viral illnesses. What's more, additional research has also shown that journaling can help reduce the symptoms of chronic inflammatory disorders such as asthma and rheumatoid arthritis. It is thought this works because conditions such as these can be aggravated by external stressors: as journaling minimizes your stress levels, it reduces the impact that stress can have on your physical health. Reducing your levels of stress and anxiety is thought to be the biggest health benefit of writing a regular journal. This is why individuals who have experienced stressful life events (such as the death of a friend or family member, the trauma of addiction, of a long term health condition) are often encouraged to keep a daily journal. Because the act of writing unlocks the logical and analytical left side of your brain, it frees up the creative right side of your brain to process the emotions that you have experienced throughout the day whilst the left side is distracted and occupied. Journaling is an excellent way to clarify your thoughts and feelings, particularly about events that make you feel confused and anxious, and find solutions to problems more effectively. For individuals working in high pressure environments or living otherwise stressful lives, writing about your anger, frustration and pain can help to relieve the intensity of those emotions and enable you to look at them with a calmer and more logical mind (which means you are more likely to find a worthwhile solution to your stressors and ultimately live a more enriching life). Many people that are new to journaling often ask where they should start: the simple answer is to just pick up your pen and start writing! There is no right or wrong thing to write about, only what is right and wrong for you. From a scientific point of view, the most effective journaling is undertaken on a daily basis and lasts for around 20 minutes each day: this will enable you to be enveloped in the full cathartic effect of the experience. Ensure that you have a quiet and private place to write, and keep your journal safe from prying eyes: if you feel your journal may be read by someone else, you will unconsciously censor your thoughts, and this will remove many of the benefits of the open stream of consciousness journal writing experience.